David Barnes paintings are highly textural. He uses a palette knife, painting in oils and using a thick impasto technique to produce bold strokes that add strength and texture to his paintings, giving it a sculptured feel. 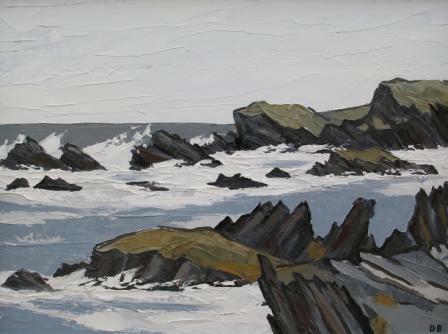 This painting style adds much to the subject in ''Near Rhoscolyn''. Strong waves pound the jagged rocks of Anglesey and we get a sense of the power of nature.